I’m bringing Vodka Lemonade to the office. Well, at least to the office knitters. I have a fantastic workplace – the benefits abound – not the least of which includes a lovely, talented, and eager-to-learn community of crafters. Every few weeks, we get together for show-and-tell, tutorials, and motivation. And each year I guide them through a project (or two). Currently, they are rocking Stephen West’s Spectra scarf. Spectra is a great entry into short rows and simple colorwork. I shot a couple of short videos to help my peeps through the tricky spots, but once they completed a few sections, they were off and running for the rest of the 85 pattern repeats (yup, 85 is a big number, but it goes by surprisingly quickly). Flattering on everyone – no, really…everyone. Perfection! 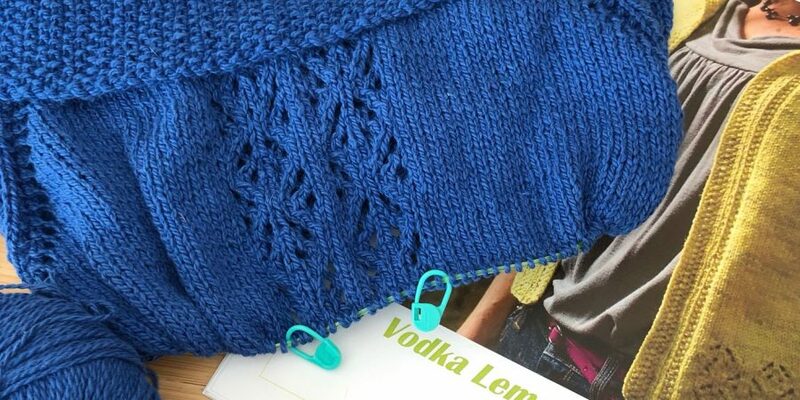 I think most of the 1,860 people who have posted their Vodka Lemonades on Ravelry would agree. I ran my new project idea up the flag pole at a recent office knitting session, and after some minor trepidation about knitting a WHOLE sweater, everyone saluted, so looks like it’s a go. Another lovely feature of this pattern is that it works in just about any DK weight fibre, so the Sublime cotton silk DK I’ve had in my stash for a few years was just the ticket (hey, I’m knitting cotton in spring – yahoo!). Of course, I couldn’t leave well enough alone, so I’ve extended the cute little single lace repeat all the way up the middle back. 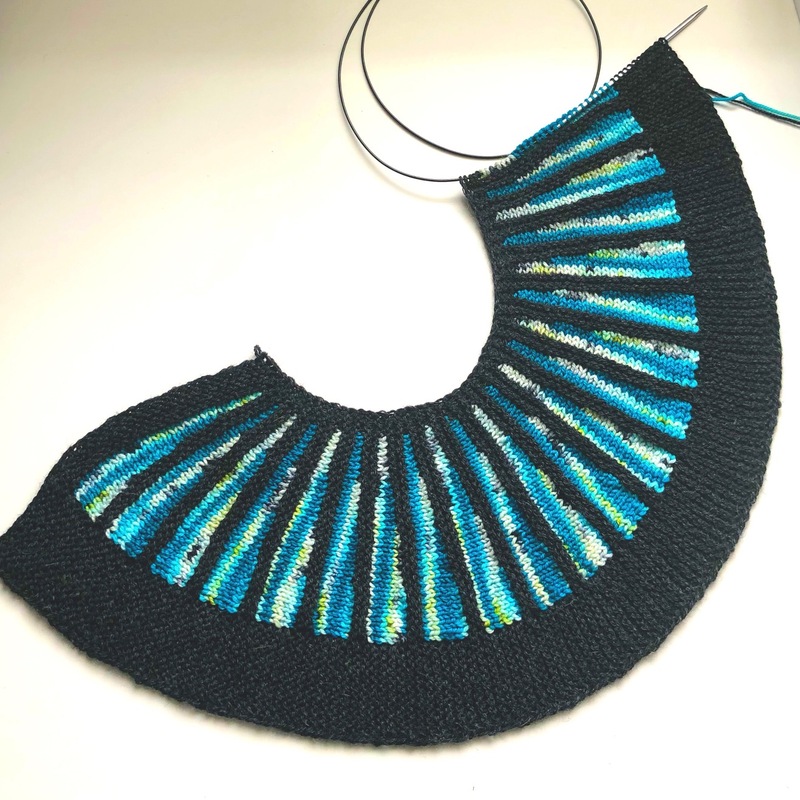 I may do the same on the fronts, starting the lace at the point where my neck shaping ends (note: the pattern doesn’t have neck shaping, but I’m adding width at the bust by increasing gradually along the inside of the front edge detail). 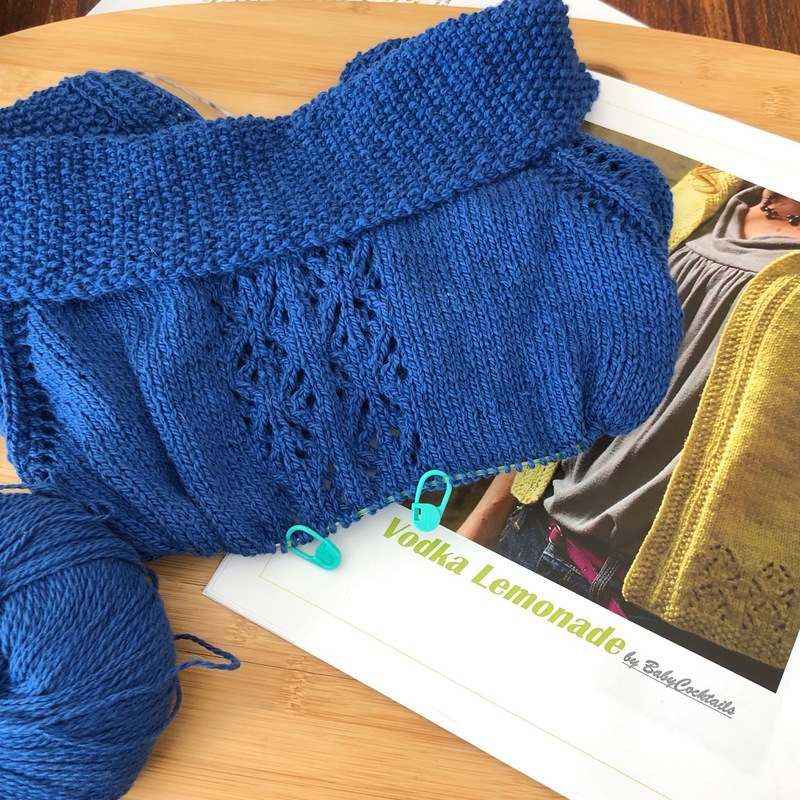 Now, I will admit that there’s a lot going on in this sweater: seed stitch, ribbing, raglan shaping with yarn overs, lace charts…none of which is a biggie on its own, but often these things are happening all in the same row. 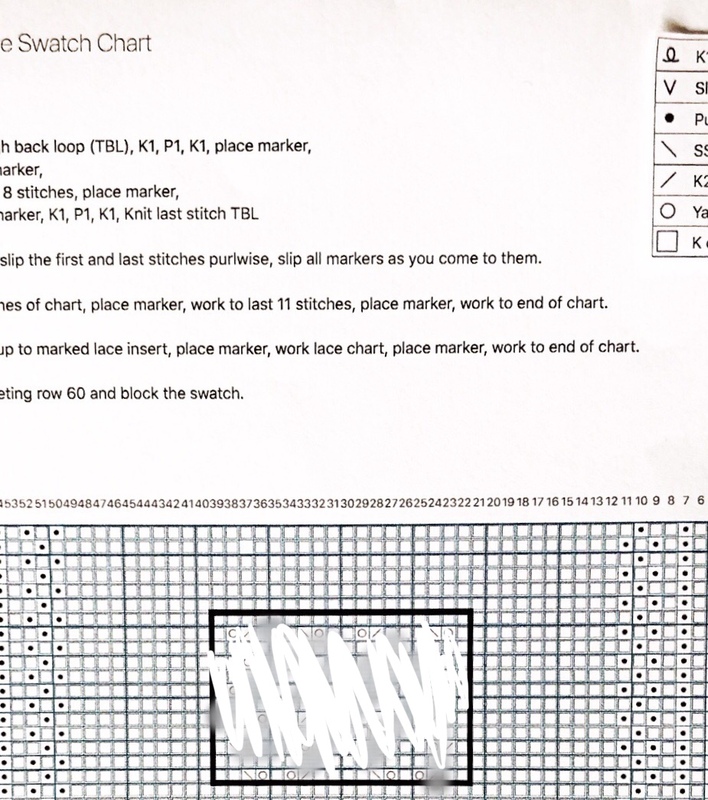 So, I charted up a practice swatch, which will allow the intrepid knitters to check their gauge while mastering all the fussy bits of the pattern. Here’s a taste of the chart. It’s a paid pattern, so I can’t give away anything covered by copyright. I haven’t set a starting date for this yet, but likely sometime in May. If you want to join in the fun, stay tuned for updates and more tips. Cocktails at the office with zero liability. Win.